The artist remains in her South African village unfazed by fame and determined to preserve her ethnic Ndebele culture. MABHOKO: Esther Mahlangu's colourful geometric artwork is exhibited in galleries around the world, but she remains in her South African village unfazed by fame and determined to preserve her ethnic Ndebele culture. The 81-year-old painter and mural artist earned an international reputation with her Ndebele motifs at a time when the art scene in her home country was focused on contemporary styles. 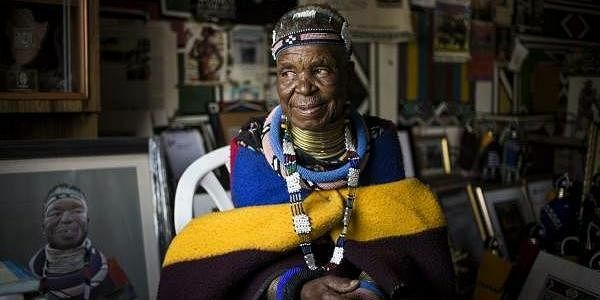 Now Johannesburg is hosting a major exhibition for Mahlangu, an elderly black woman with no art training who rose to global acclaim using a skill passed down for generations. With just a chicken feather, Mahlangu first painted mud huts and chipboards before moving on to luxury cars, vodka bottles, skateboards and footwear as her intricate patterns became huge commercial hits. At home in a dusty village in South Africa's eastern province of Mpumalanga, the sprightly great-grandmother looks nothing like an artist who has exhibited at the Centre Georges Pompidou in Paris, the 5th Biennale in Lyon, France, and London's British Museum. She goes about her daily chores, sweeping the courtyard in front of her hut and worrying about crying babies. Unlike many locals, she still dresses in the distinctive Ndebele traditional attire, with heavy beaded necklaces and dozens of copper rings around her neck and legs. "Working with famous people has not changed me," she told AFP. "I am not intimidated by anything and not even once have I changed who I am to fit in with their culture." The only change she has incorporated into her work is replacing natural pigments of cow dung and soil with acrylic paint. Mahlangu's first big international break came in 1989 when she was 54. Her ornately decorated house had caught the eye of French researchers who invited her to the Pompidou Centre. In Paris, she painted a replica of her hut for an exhibition. Mahlangu's heavily wrinkled face lights up in disbelief when showcasing what she had been doing since she was a child. "I only used chicken feathers, no brushes," she told AFP taking a break from her chores. "I am an ordinary Ndebele woman, doing what I was taught by my mother and grandmother," she chuckled. She said she was amazed by the interest her work attracted, an experience that prompted her to teach the age-old Ndebele skill to youngsters in her village. "My aim is to preserve the Ndebele culture. I don't want it to get lost with civilisation," she said. German carmaker BMW has collaborated with Mahlangu on two occasions when she painted the body of their luxury sedans with her iconic Ndebele shapes. Her first collaboration with the company in 1991 made her the first woman to be invited to take part in the Art Car project, following in the footsteps of Andy Warhol and Roy Lichtenstein. "Painting the car was exciting. I never felt under pressure," she said. The car has been displayed in major exhibitions around the world, and in February ended a four-month show at the British Museum. South Africa was not quick to recognise Mahlangu's talent, though she has had solo exhibitions in Cape Town. In 2006 she was given a presidential award. "I had to travel to Pretoria to accept it," she said. "It made me proud to be seen as doing something for the people." In her cramped two-room thatched roof hut that doubles as a makeshift gallery stands a wooden cabinet displaying some of her many accolades. "A lot of people have looked at Esther's work as being more on the craft side," said Craig Mark, director of The Melrose Gallery in Johannesburg. "She hasn't been really recognised in the visual arts side in South Africa until very recently." The gallery is showing a collection of Mahlangu's latest work, a series of paintings paying tribute to the late freedom icon Nelson Mandela. The paintings were created by embellishing prints of drawings created by Mandela in 2001. At the opening of the exhibition, the painter said she had no intention of slowing down despite her age. "I may no longer have the same energy as I used to, but I can still do everything."